Susie (Knight) Calder was born on Lead Mine Road, the oldest girl in a family of 12 children. In 1947, at the age of 16, she began working at the Union Sardine Factory owned by R.J. Peacock Canning Company. With images provided by Susie Calder and Edith Comstock. Audio clips are included throughout the exhibit. Click on the link to hear Susie. J: What was your job? What did you do during the day? S: Well, we had these tables where we worked. There was a carrier, we called it, and the flakes with the fish on them came down the carrier. We’d pick the flake right up and put it on our table and pack the fish. Sometimes we’d pack 16 or so little fish in a can. They were called ‘snippers’. The bigger ones, we’d pack four or six to a can. We were told how many to put into each can. We worked with a partner. There was another woman on the other side of the table, and that was fun because you did socialize and have a little bit of life other than just packing. We’d work until that load of fish was packed. Sometimes we had to work over. Sometimes we got done at six. We started at seven in the morning. When I started working in ’47 the work was steady. All the factories were busy. J: How did you know when they had fish to pack? S: Well, they would blow the whistle for the ones in town. So many whistles would be one factory and so many whistles would be some other factory. And people would call one another and spread the work that there was work. J: You had said something about a bus coming around. S: Yes, when my mother worked she used to ride on the back of a truck that would come and pick her up. J: Your mother, with 12 children, how did she have time to work in the canneries? S: Well, that was when we got older. She worked in the factory when I went to work. We were all older and, well, she really had to. It was a necessity. J: When you stopped working in the ‘50s, did you stop because you wanted to or because the industry was going down? S: When the industry went down they closed that factory (Union) and I went to work at the other Peacock factory downtown. Then, after that closed, there wasn’t anything to do. J: What was it like for the town during the busy time? S: Well, it was booming. You know, people worked and every Saturday and Saturday night people would go downtown and that was a treat, to go downtown and sit watching all the people. You know, people got around, and they were happy. It seemed to be carefree, more than it is today. When the factories were closing it was very sad because that was the only work there was, other than clamming. And that was hard work. I never could dig clams. I’ve tried it. That was all the work there was and it was very sad for people. J: You were chosen Sardine Queen in 1949. Can you tell us about the contest? How long had it been going on? S: Well, it started the year before, in 1948, and Faustina Sawtelle was the Sardine Queen at that time. They picked one girl from each factory and there were seven factories and I was the one chosen at the Union factory. J: How did you feel when you found out that you won? S: Well, I couldn’t believe it. I just couldn’t. It was a great thing and it was good for my mother and father, too. J: Where did you get your beautiful gown for the ball? S: Well, Peacock’s bought my dress and my shoes and had my hair done. They paid for all that, and the bouquet – a dozen red roses. I bought my gown at Unobsky’s Store, downtown. It was a beautiful thing. It was lovely. The Seven Sardine Queen Contestants The contestants met at the town wharf before the ball for a photo op. 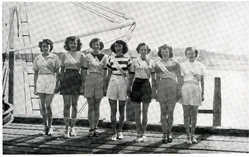 Susie is third from the right. J: I notice in the photograph that you had a very nice crown. Did someone make it for you? S: Well, I don’t know who made it; whether it was Noni MacBride ... I don’t know. It had a gold foil covering. I still have it. I’ll show it to you. I remember that there were seven of us contestants. First we had to go down to the wharf and have our pictures taken. That was just before the ball. Of course, it was all strange to me, but I enjoyed it. The ball was lovely. After the ball, I didn’t know this was going to happen, but there were 25 merchants in Lubec and when I got back home that night there were 25 gifts right there on the table. We had a great big, long table because there were lots of us, and all those gifts were right on the table, one from each merchant. There were groceries; they were all useful. We had a big family so that was great. J: Did each factory have its own float in the 4th of July parade? S: Yes, I think so. Of course, I didn’t see the parade because I was riding on the Peacock float. The women decorated the floats and ours was beautiful. John Tyler drove the truck that pulled the float. J: Did they continue to hold the contest? S: No, I think that was the last year. The factories were going down. Of course, we didn’t know it but they (the owners) knew by their books that things were going to happen. It just started to go right down hill. J: Susie, there were 12 children in your family. Was everyone working in fishing or fish processing? S: Yes, in the factories, and at the can plant … and then, when they couldn’t do that, that’s why they went away to Massachusetts. Some of my brothers went into the service. They went away to work because there was nothing here. Then, the can plant closed. J: Is there anything else you would like to say about your work at the canneries? S: It was a nice place to work. The boss was good and I don’t think that anyone ever had any trouble. As far as I could see it was just a happy gathering and a place to work and earn a few pennies. J: When you think about the work that you put in, do you feel that you were fairly compensated? S: Well, no I don’t. But we all had to work and we all were very fortunate to earn a nickel and, when I look back on it, they (the owners) had a lot of expense, too. Still, we wished it was more, of course, and we did work hard.